Owners of the Wii version of Rock Band 2 will have some hard decisions to make tomorrow, as more than two dozen new tracks arrive on the title's in-game store. 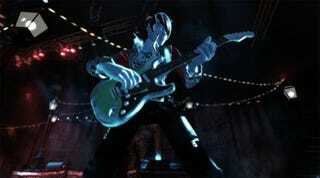 A huge batch of Wii-specific updates hit Rock Band 2 tomorrow, from Alien Ant Farm to the Buzzcocks to T-Rex. A mix of both new and old arrives, including a half-dozen from The Grateful Dead. It's a lot like this previous update, but, you know, for the Wii. This week, the Wii edges ever closer to the 670 songs already released for Harmonix and MTV Games' band game with one of its biggest updates ever. Each of the following 25 tracks is $2.00 (or 200 Wii Points). Some songs, denoted with an asterisk, are not master tracks. The Allman Brothers Band "Blue Sky"
The Allman Brothers Band "Midnight Rider"
The Distillers "Drain the Blood"
Grateful Dead "China Cat Sunflower"
Grateful Dead "I Need A Miracle"
At the Gates "Blinded by Fear"